Do you have a leak? Hear a funny noise? Not sure what is wrong with your hot tub? We can fix it! With 20 years of hot tub knowledge, our spa service department can get you fixed up right! We service all brands/makes of hot tubs. 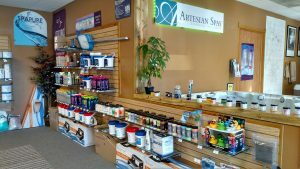 Summit Spas also carries a full line of hot tub chemicals and accessories. Learn more about our spa chemicals and accessories below or contact us with your specific needs. To schedule your Colorado hot tub repair please fill out our form below or call 970-686-5299 or shoot us an email and we will get your repair scheduled as soon as possible. We keep our rates affordable and work hard to earn your business by promising honest and efficient service. Servicing Northern Colorado including Windsor, Greeley, Severance, Johnstown, Eaton, Fort Collins, Loveland and more. Summit Spa carries a full line of chemicals and accessories. From chlorine, bromine, Spa Marvel and filter cleaner, to cover care — Everything you need to keep your spa looking and running like new. If we don’t have it in stock, contact us and we can get it.